Pimm's Original No.1 Gin Cup original mixer, made since the year 1840 from a closely guarded, secret recipe.Pimm, a farmer's son from Kent, became the owner of an oyster bar in the City of London, near the Bank of England. He offered the tonic (a gin-based drink containing a secret mixture of herbs and liqueurs) as an aid to digestion, serving it in a small tankard known as a "No. 1 Cup", hence its subsequent name. In 1851, Pimm's No. 2 Cup and Pimm's No. 3 Cup were introduced. 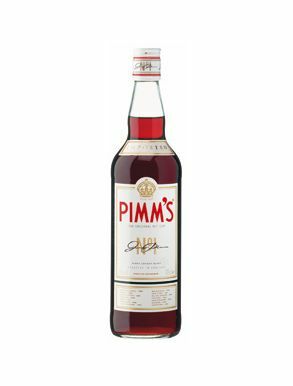 Pimm's began large-scale production in 1851 to keep up with sales to other bars. Take one slice of orange, lemon, apple, cucumber, strawberries per person and one sprig of mint and add to three parts lemonade to one part Pimms and enjoy the most quintessentially British summer drink.